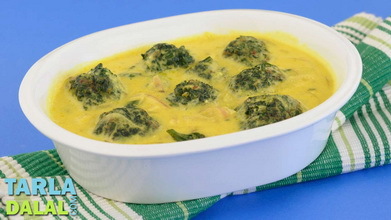 Mouth-watering steamed koftas with sprouts and greens can turn the simple Gujarati kadhi into a low cholesterol, heart-friendly treat. 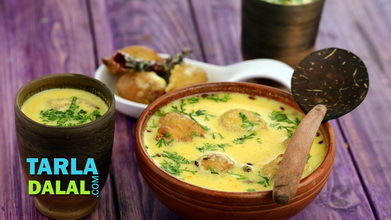 A tempering of cumin, mustard and fenugreek seeds lends an irresistible aroma to this Healthy Kofta Kadhi while the use of low-fat curds gives it a perfectly authentic texture in a low calorie format. 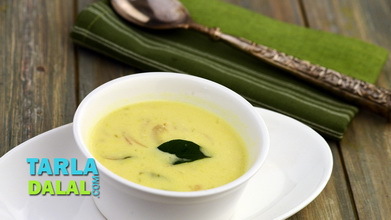 Combine all the ingredients along with 1 tbsp of water in a deep bowl and mix well. Place spoonfuls of the mixture at equal distance on a steamer plate and steam them in a steamer for 6 to 8 minutes or till the koftas are firm. Keep aside to cool completely. 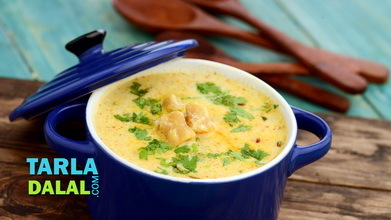 Combine the curds, besan and 2 cups of water in a deep bowl and mix well using a whisk till the mixture is smooth and lump-free. Add the turmeric powder and ginger-green chilli paste, mix well and keep aside. 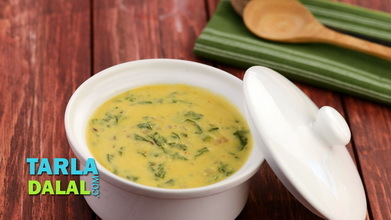 Heat the oil in a deep non-stick pan and add the mustard seeds, fenugreek seeds and cumin seeds. 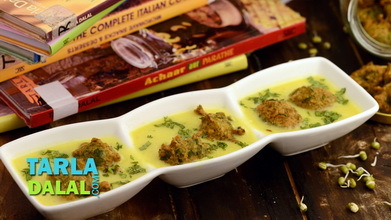 When they crackle, add the asafetida and curry leaves and sauté on a medium flame for a few seconds. 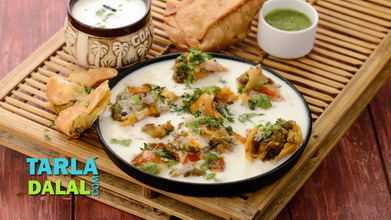 Lower the flame, add the curds-besan mixture and salt and mix well. Cook on a medium flame for 4 to 5 minutes, while stirring occasionally. Keep aside. 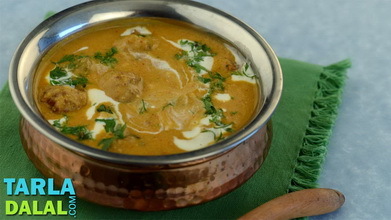 Just before serving, re-heat the kadhi, add the koftas, mix gently and cook on a medium flame for 1 to 2 minutes.